Once again, my disclaimer . . . I have a very open sense of humor. I’ll laugh at almost any kind of humor, ergo I actually enjoyed this movie as well. I had mentioned my character flaw in the Hot Rod review and similarly I realize that not everybody will like this kind of movie. Thus I mention the disclaimer. This movie is goofy, stupid, corny, physical, and predictable at times. In the Rush Hour 3 review I mention the “tears of laughter” criteria and yes I did get teary eyed at one point during this film but not for very long. Overall it was fun to watch but you need to go in expecting exactly what you should expect from a movie like this, no more and no less. I was hearing comparisons to Dodgeball, but Dodgeball had a more substantial cast and was a better quality comedy. I don’t know for sure if this one will develop a following, like Borat, Napoleon, or Dodgeball, but it does have three features that make it special in its own way: it’s a spoof on Bruce Lee’s classic, Enter the Dragon, it’s all about ping pong, or as the Chinese call it, ping pong, which is a game I enjoy playing, and it’s got Christopher Walken. Hey, no disrespect to Mr. Lee, but it is always nice to reminisce on anything Bruce Lee, even if it’s a spoof so long as it is light hearted and in good taste, and I think this one is. Randy Daytona (Dan Fogler) is at the top of his game. With a chance to win Olympic gold for table tennis, he is distracted by his father’s ill-fated wager on the match placed with Chinese thugs. He loses the game, his father, and his passion for ping pong. Years later, the FBI is looking to recruit him in order to infiltrate a group of Chinese mafiosos lead by Feng, not Fang, Feng (Christopher Walken). The FBI want to bring Feng down and he, being a ping pong pro himself, likes to hold an underground best of the best ping pong tournament at his secret compound. This is where Randy comes in. He will need to regain confidence in his game in order to face the man that defeated him in the Olympics, Karl Wolfschtagg (Thomas Lennon), and gain the courage to face the man responsible for his father’s death, Feng. He does this with a little help from his friends, ping pong Master Wong (James Hong), his niece Maggie Wong (Maggie Q), and FBI Agent Ernie Rodriguez (George Lopez). Each of these characters were perfectly cast and the corresponding actors kept the movie alive with their performances. Although, I think George was underutilized. He is arguably the funniest man in this cast but he doesn’t really steal the show. 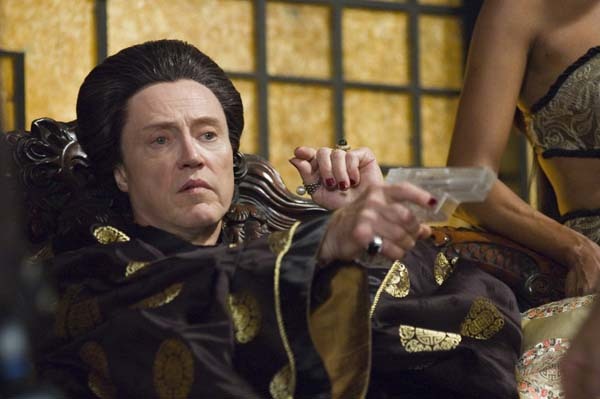 Chris Walken, on the other hand, does. His very presence in this movie is a treat. And wait till you see his costumes . . .
It’s funny how this movie spoofs Enter the Dragon and the title spoofs another Bruce Lee movie, Fists of Fury. I guess Enter the Pong wouldn’t make a whole lot of sense so I can see why they went with Balls of Fury. Speaking of Bruce Lee, Jason Scott Lee has a small role in this movie. You might remember him as Bruce Lee in the film Dragon: The Bruce Lee Story. The makers of this project must be Bruce Lee fans. They must be fans of ping pong too. The ping pong play and special effects were very well done and quite impressive for a comedy. Speaking of comedy, this is Ben Garant’s second time around as director of a motion picture and he is off to a decent start. His first was Reno 911! : Miami. Not exactly blockbusters, but he definitely has a good fan base. He also has talent as an actor (Reno 911! : Miami) and even more so as a writer having Taxi, The Pacifier, Herbie Fully Loaded, Night at the Museum, Reno 911! : Miami, and now Balls of Fury on his resume among others. Looking forward to seeing more of his work. In the meantime, ping pong anyone?